William Adair was born July 1, 1893 in Waterford, Kings Co., New Brunswick. He married Nellie May Stewart on December 25, 1914 in Regina, Saskatchewan. William enlisted on May 22, 1917. In 1919, he settled in Teepee Creek and became their first school teacher. His homesteads were located at 16-74-3-W6 and 21-74-3-W6. William also served in WWII in the R.C.A. Medical Corps. William passed away on April 25, 1966, the day of his wife's funeral. George "Griff" Adams was born in Edinburgh, North Dakota on September 21, 1895. He joined the army on May 7, 1918, but was immediately discharged (at his request) so he could join the RAF. Griff arrived in Beaverlodge in 1929 to be a partner in his brother William's business. After a number of years he moved to Manitoba to take care of his parents. He died in September 1950 of a brain hemorrhage. Norman was born in Simcoe County, Ontario on October 30, 1890. He moved to Saskatchewan as a young man and enlisted in Regina in May of 1915. 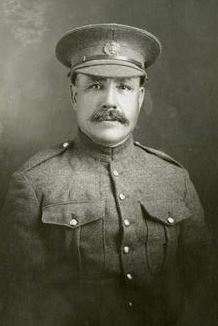 After his discharge in June of 1919, Norman came to the Peace country. He moved back to Ontario in the early 1960s and married the widow of an old friend. Norman was killed in a car crash in August of 1972. William was born in Edinburgh, North Dakota on September 6, 1893. He was injured during the war and later returned to Canada on sick leave, just before the end of the war. He married Abigail Mildred Black while living in Rossburn, Manitoba. William and Abbie moved to Beaverlodge in 1928, where William opened a hardware store. William died of injuries received in a car crash in Vancouver on January 15, 1956. He was buried in Grande Prairie. Note: According to William's military service file, he sustained a knee injury while on parade in early May 1916, before he joined the RFC. His commanding officer stated that "the soldier was in no way to blame". According to his Medical Case Sheet, his knee had already been giving him trouble in February/March of 1916 at the Somme, and he was then admitted to the hospital and remained there for some time. The diagnosis was synovitis in his right knee. George was born in Goderich, Ontario on January 3, 1896. He shipped overseas with brother Stanley and started training in England, then went to France. The brothers arrived in England on Oct. 6, 1916 aboard SS Laconia. George was wounded on July 20, 1917 while defending Hill 70, and his brother Stanley carried him to the rear. A few days later, on July 24, 1917, George died of many shrapnel wounds to his legs and chest. He was buried in the Lillers Communal Cemetery, near Bethune, France. Irwin Agar was born in Dungannon, Ontario on June 6, 1897. He came on the first train to Grande Prairie in 1916 and filed on a homestead at Kleskun Lake, which he later sold. He was drafted in May 1918. Irwin returned to the Peace Country in 1937, where he farmed until he fell off a ladder and broke his back in 1959. He retired to Vernon, BC, where he died on May 4, 1973. Stanley was born in Goderich, Ontario on November 12, 1896. He enlisted in December 1915 and arrived in England on Oct. 6, 1916 aboard SS Laconia. According to medical records, he was completely deaf in his left ear ("auditory nerve deafness") as a result of being hit in the ear with a snowball as a child. Stanley took part in the march to Germany at the end of the war. He returned to Canada in 1919 and married Lelia Durnin in August of that year. They farmed in Saskatchewan until 1937, when they (along with brother Irwin) came to farm in Dimsdale. Stanley died in 1957. William was born in Iowa in August of 1888/1889. He owned a homestead at 23-72-11-W6. During World War I he served in the American army. He was killed in action in July of 1918 after only a few days in the trenches. Fred was born in Township Dunn, Ontario on March 23, 1883. Before World War I, he was a partner in a law firm in Calgary, together with John Brownlee. He and his wife, Elnora Evelyn Kelly, were living in Calgary at the time of his enlistment in June of 1916. Fred shared his brother's (W.D. Albright) confidence in the Peace country and filed on a homestead at 8-72-9-W6. However, he was killed in action at Passchendaele on October 26, 1917 without having had the opportunity to develop his land. His grave marker in Larch Wood Cemetery is inscribed with "Who was faithful to Him that appointed Him Heb. 3.2"
Charles Edward Alexander was born in Stony Plain, Alberta in December of 1898. Edward married Kae Eggen from Edmonton in 1930. He lived in several mining communities in western and northern Canada, finally settling in Fort Saskatchewan due to ill health. Edward and Kae had two sons, William and Arthur. Edward died in 1973 and is buried in Evergreen Memorial Gardens, Fort Saskatchewan. William Paul Alexander was born on October 4, 1897 in Rossland, British Columbia. He farmed at Rycroft (4-78-5-W6; 9-78-5-W6; 5-78-5-W6) after the war and served for a time as Spirit River's councillor. He later moved to Appleton in 1935 to assist his sister, Jean, by then a widow. He married Ida Walker there. William died in 1966 and is buried next to his mother in the Rycroft cemetery. Sources: Pioneers of the Peace p.122. Joseph was born in St. Rocque, Quebec on September 24, 1895. He filed for a homestead in Guy in 1922 (SE 24-72-22 W5). On November 14, 1925, Joseph married Marie-Jeanne Belanger. He died on December 24, 1962 and was buried in Falher. Arthur was born on October 1, 1896 in Summerfalls, New Hampshire. He arrived in Falher with his parents in 1914. After serving in the war, he returned and filed for a homestead on SW 14-78-21-5. In 1946 he married in Calgary. Albert Allard was born on April 25, 1894 in St. Roch L'Achigan, Quebec. He came to Donnelly, Alberta in 1914 and filed on a homestead at NE 1-78-21-5. On April 23, 1915, Albert was on a ration party at Ypres when a shell burst close to him, knocking him down. He was not rendered unconscious, but his shoulder was injured. He was invalided to England to be treated for various injuries/illnesses, including shell-shock. On May 4, 1915, his Medical Case Sheet read: "much improved, but not really well." Three months later, he was 16 pounds lighter than his usual weight, and his shoulder was still somewhat stiff. But worst of all, he was in a very nervous condition, "his whole being quivering all the time." He was sent back to Canada in August, 1915 because of nervous shock. After the war, he sold his land to Dr. Gauthier and returned to Montreal. It is unknown whether he was ever able to recover. Arthur was born on August 13, 1877 in London, England. He came as a homesteader in 1914 and filed on 32-73-5-6, west of I.R. Hunter. He went missing on November 29, 1916 (the army considered him a deserter) and was presumed dead. Charles was born in Brookdale, Manitoba on December 16, 1893. He filed on a homestead near Bezanson (SW 15-72-3-W6) in 1916. In January 1918 he went overseas. He received a bullet wound in left foot on September 2, 1918 at Arras; fortunately there was no permanent disability or deformity. Charles was discharged from the army in February 1919. In 1931, after an adventurous life, Charles married Elsie Cox of Justice, Manitoba. He brought his family back to the Peace Country in 1944. He died in Grande Prairie in January of 1981. George was born on September 29, 1897 in Brookdale, Manitoba. He came down with the measles in August 1918 and was discharged in September of 1919. After the war, he met Thelma Louise Robideau in Bezanson and they were married in Edmonton on January 30, 1922. They returned to the homestead in Bezanson (9-72-3-W6; 10-72-3-W6; 15-72-3-W6). George died in Bezanson on May 19, 1966. Alexander Anderson was born in Arbroath, Scotland on September 30, 1874. He joined up in Edmonton on July 22, 1915 and deserted on January 25, 1916. Alexander's homestead was located at 18-72-5-W6. Axel was born on May 15, 1893 in Lyle, Minnesota and came to homestead in LaGlace (NW 7-74-8-W6) in 1911. He was sent overseas in 1914, but was discharged after being gassed. Upon his return, he sold his homestead and filed on NE 9-74-8-W6, a corner of which later became part of LaGlace. Axel never married and died in Grande Prairie on September 20, 1971. Note: The community book biography contains some discrepancies with Axel's military service file, which may be viewed at the Enlistment Form link below. Evidently he went overseas in 1918 and was discharged in June 1919; nothing in his records mentions being gassed, only that he had measles and mumps. Axel died on September 20, 1971. John was born on January 19, 1885 in Glasgow, Scotland. He filed on a homestead at 22-74-8-W6 in 1914, but joined up later that year. John was awarded the Military Cross on October 8, 1915 "For conspicuous gallantry near Messines on 8th October, 1915, when he went out with Private Wythe to a German sap. Lieutenant Anderson entered the sap, and Private Wythe crept along the edge. They met and shot two Germans, exchanged shots with three others, and brought back the rifles of the men they had killed. Next day they returned to the sap, and attacked another party of Germans, who retired, leaving a clock, some bombs, a periscope, etc., behind. These they brought in. Much valuable information was gained." On April 9, 1917 at Vimy Ridge, John received shrapnel wounds to his left jaw, which chipped the bone, and also to his neck. He was killed in action at Passchendaele on November 10, 1917, the final day of a 102-day battle. Leslie was born on April 30, 1890 in Plantaganet, Ontario. He filed on a homestead at 34-77-6-W6, near Spirit River. Leslie was drafted near the end of the war and reached France in June 1918. Oliver was born on March 22, 1893 in Oklahoma. When the war began, he was farming in Clairmont (24-72-6-W6) and he enlisted in Edmonton on July 15, 1916. However, Oliver was deemed medically unfit (rheumatism, which started at the age of 10) in April 1917 and he was discharged. Phoebe Elizabeth Lawrence was born in Stourbridge, England in 1878. She married Charles Buck in England on March 11, 1918 and followed him home to Canada after the war. Charles had been badly gassed during the war and died in 1920. Phoebe married Norman Anderson in 1921. In the mid-twenties she operated a post office and store on their farm (6-74-8-W6) while her husband hauled the mail to Lake Saskatoon from Wembley. Phoebe died in January of 1963. Frederick was born on December 17, 1889 in Claybrook, England. Prior to coming to Canada, he served with the Leicestershire Constabulary from 1910 until 1912. He joined the RNWMP at Regina on August 9, 1913 and continued to serve until 1937, apart from the time spent in the army during World War I. In 1915 he went to Fort Good Hope in search of two priests who were thought to have been murdered by the natives. At this time he was a sergeant in the Grande Prairie Detachment of the RNWMP. He enlisted in the RNWMP unit in 1918 and went overseas to serve in France. He arrived exactly one month before the Armistice and saw action in France and Belgium before being discharged on March 13, 1919. Anderton Channel in the NWT was named after him. Frederick died in Surrey, BC on October 20, 1974. Alfred was born in Quebec on May 16, 1871, according to his service file. However, according to his homestead record, he was 53 when he filed on SW 28-77-20-W5 in 1917, which would have placed his year of birth ca. 1864. It is likely that Alfred lied about his age to enlist in the army in 1916. The deception did not work as planned, as he was discharged (medically unfit) on May 2, 1916. Constantine was born on August 7, 1897 in Russia. He, along with his younger brother John, came to Canada in 1913 at the age of 15 to join his elder brother Emil. Constantine, or Fred, was a miner in Nova Scotia until he joined the army in World War I. On Christmas Eve 1918 he arrived back in Canada. While in Europe, Fred had made friends with Pete Stalberg of Beaverlodge and together they came back to the Grande Prairie area. Fred filed on land near Sexsmith, where his brother John joined him in fall of 1919. In fall of 1922 Fred took a job in Vancouver, and he never returned to the Peace Country until he visited his brother in 1966. Joachim was born on August 18, 1897 in St. Albans, Quebec. He filed on a homestead (SE22-78-21-5) in 1915. On June 7, 1918 he was drafted into the army. Joachim was discharged just over a year later on July 18, 1919 at which time he returned to Falher. He remained single and lived with his sister Cecile in the priest's residence in Donnelly. Joachim died in McLennan on March 7, 1984 and is buried in Ste. Anne Cemetery in Falher. David "Ed" Armstrong was born in Albemarle, Ontario on March 3, 1895. When their father died in 1914, Ed and brother Leo came west to file on a homestead, 35-72-11-W6 west of Grande Prairie. The boys returned to Ontario and in 1916 Ed, Leo, their mother Susan and sisters Ila and Dessie loaded their supplies and traveled to the end of the rail line in Grande Prairie. Once there, it took them four days to travel to their homestead near Hythe, Alberta. Ed was drafted in March of 1918, to serve in the war but was discharged months later as the war had ended. In 1922 he married Grace Evelyn Everton. The couple stayed in the Hythe area. Ed died in the Beaverlodge hospital on February 19, 1960. Cecil was born September 14, 1890 in London, England. While training in England he met Lillian and it was "love at first sight," he said. He joined up on September 25, 1914 and was discharged on May 7, 1919. After the war Cecil returned to Canada and acquired land near Crossfield, Alberta. Lillian joined him in 1920 and they were married in Calgary. The Ash family moved to the Peace Country in 1930 after losing their farm in Crossfield. Cecil died in Grande Prairie on September 7, 1977. William was born on March 11, 1885(1886?) in Keswick, England. He came to Canada around 1910 and at the time of his enlistment in 1915 was living in Saskatchewan. William received a gunshot wound to his right arm at the Somme, and injury to his scalp as well; he was seriously ill. After his recovery, he joined the Railway Troops. In 1917 he was gassed. William was granted permission to marry on Sept. 21, 1918 and on October 1 his pay started going to his new wife. He was discharged on May 1, 1919. William, along with his wife Doris and daughter Joan, moved to Valhalla from England in 1929 and filed on a homestead at NE 33-75-9-6. They didn't farm much, but raised Persian cats for sale. He died after a long illness caused by war injuries on January 29, 1939. Celestine was born on February 10, 1894 in Grouard, Alberta. He was drafted in June of 1918 and arrived in England in August. Celestine never saw active duty at the front lines in France, and was discharged on August 28, 1919. He died in June 1962. Leon was born January 28, 1891 in Greisfield, Quebec. He was drafted in 1918 but never went overseas as he contracted the influenza in Calgary. He was sent back to Grande Prairie and died in the isolation hospital on November 4, 1918. James was born on April 2, 1883 in Odessa, Ontario. He was drafted near the end of the war and settled in Flying Shot in 1921. James loved young people, and one Christmas he knit and hung 500 pairs of mittens on the tree at the Flying Shot Lake School for the children of the district. He died in Grande Prairie on January 7, 1964. Zeba was born in Odessa, Ontario on February 12, 1890. His wife's name was Jeannette. The couple had two young children when he enlisted in 1917: Asa Carleton (2 years) and Verna Emily (2 months). Simeon Babineau was born in St. Felix de Kinsey, Quebec on January 13, 1889. He came west in 1913 and filed on a homestead in June 1914. Two years later Simeon was called up to serve in the American army. After the war he settled in Falher. He married Theresa Brenhofer on January 14, 1930; she died only four years later. In 1941, Simeon moved to Montreal but he returned to Falher in 1950. He died on February 11, 1971 and was buried in the Falher cemetery. Douglas Bailey was born on July 6, 1896 in Brookley, London, England. His father was William Oliver Bailey of England, and he had two brothers, Arthur and Henry. He came to Saskatchewan from England in 1910. Douglas served in the first World War. He was wounded twice. On October 26, 1917 he received a gunshot wound to his left arm and on August 21, 1918, another gunshot wound, this time to his right knee. Douglas was discharged in June 1919. In 1922 he filed on a homestead in the Peace area, and married Mrs. Clara Johnston (nee Myers). They farmed and settled in the Buffalo Lakes area. Mr. and Mrs. Bailey had five children: Marguerite Johnston, Ronald Johnston, and Edith, Gwen, and Barbara Bailey. Douglas died in October 1977 at age 81 in Grande Prairie AB. Melford was born in Mount Albert, County York, Ontario on December 22, 1889. He and his wife Edith and their three children came to the Peace country in 1929 and settled in the Mount Saskatoon school district, where Melford served on the school board. When World War II broke out in 1939, Melford once again served in the army. He died in March of 1974. William was born in Yorkshire, England in 1894, though spent most of his boyhood in Ireland. During the first world war, he served in the Royal Field Artillery for four years, in Italy, Greece, and Turkey. In 1920 he came to Canada and homesteaded at 30-71-10-W6 and 31-71-10-W6 near Beaverlodge. William raised pheasants on his farm and over the years was able to release hundreds of pheasants about the district. In 1937 he married Sadie Martin. The couple had three sons. On July 20, 1969 William's brother Sydney was coming back from Texas with a new helicopter and stopped to pick up William and Sadie for a visit to Watson Lake. A mechanical failure in the helicopter forced a crash landing near Fort Nelson. Sydney crawled out to the nearest highway, nearly two miles away, to get help in spite of his injured back, but William was pronounced dead before help arrived. Robert "Bob" Baker was born in Caledonia, Ontario on May 3, 1885. He arrived in the Peace country in April 1912, coming by stage coach over the Edson Trail, and settled in the Hythe area. Bob was drafted in March of 1918 and served in the 78th Field Artillery in France and Belgium. At the time when the Armistice was signed, Bob was engaged in the Battle of Mons. After the war, Bob took a soldier's grant and purchased a second quarter of land. He married Alice Giberson on May 15, 1930. Bob died on February 11, 1983 and was buried in the Hythe cemetery. Matt was born in Lillehammer, Norway on May 22, 1890. In 1894, he came with his parents to North Dakota. Matt enlisted in the American army in June of 1917. After the war, he came up to the La Glace area to join his parents, who had relocated during the war. He filed on a homestead at NW 12-74-9-W6, and bought the La Glace store. In 1923, Matt married Hilda Johnson; the couple had four children. They sold the store in 1927 and moved to the farm; ten years later they sold the farm and moved back into La Glace, where they built a cafe and boarding house. Matt and Hilda moved into Grande Prairie in 1945, and worked there until their retirement in 1969. Matt died on June 30, 1974. He was taken 'on staff' in Copenhagen in December of 1918, and repatriated on February 1, 1919. Harry was granted permission to marry on February 15, 1919, and was married in spring of that year. He worked as a teacher in Edmonton from 1919 until 1929, and as the inspector of schools for Grande Prairie in 1929 and 1930, a position to which he returned in 1933. Harry died in January or February of 1965. David Barber was born on October 18, 1890 in the township of Arthur, Ontario. He joined the army in December of 1916. On August 16, 1917, David received burns and wounds when a mine exploded during instruction in trench raids at Longmoor Ranges, England. Particles of powder were embedded in his skin. He was in the hospital for two months, and returned multiple times during his time in the army because of an abscessed face, likely a result of his previous injuries. On October 1, 1918, he was reported missing in action, but later the same day was found safe with his unit. David was awarded a Good Conduct Badge on December 7, 1918. After the war, he settled in the Bad Heart area, as did his brother Percy. David filed on homesteads at 9-75-2-W6 and 4-75-2-W6. He died on March 12, 1947. Percy was born on April 17, 1894 in Mount Forest, Ontario. He served in both France and Belgium and was awarded Military Medal in 1917. Percy and his brother Dave settled in the Bad Heart area; Percy homesteaded at 20-75-2-W6 and 21-75-2-W6. He died on January 20, 1962. David Barr was born on July 23, 1889 in New Cumnock, Ayrshire, Scotland. He came to the Peace country in 1914 and homesteaded in the Sexsmith area, on the SW34-73-5-W6. Dave joined the army in 1915 and was killed in action on April 9, 1917 at Vimy Ridge. Grave Reference: I.V. A. 9. William was born in Burton-on-Trent, Staffordshire, England on November 18, 1876. In 1915, he filed on SW 31-70-6-W6. He was married and had three children. On July 5, 1916, William enlisted in the Canadian Army, stating that he was a widower. It seems that he was turned away at this time, but reenlisted on November 11, 1916. William served only in Canada and was discharged on November 21, 1917, having been found medically unfit (likely due to his age). William died on September 3, 1928. Harold Barrette was born in Superior, Wisconsin on July 13, 1896. He came to Canada in 1915 and was drafted in March of 1918. Harold died in his home east of Sexsmith on December 15, 1941. Gabriel Basly was born on March 28, 1885 in Gennevilliers (Seine-St. Denis), France. Young men in France were required to serve in the army for three years, so in 1906 at the age of 21, Gaby enlisted in an infantry unit at Caen. When he immigrated to Canada in 1907 he notified the French Government about his move and inquired about his army status. Gaby took out a homestead in Big Valley, Alberta, about 67 km east of Innisfail. Gaby never went back to the war. He settled back into farming, and in 1926 headed for Grande Prairie to start a new life. George was born on January 11, 1882 in Linwood, Ontario. He came over the Edson Trail in 1911. 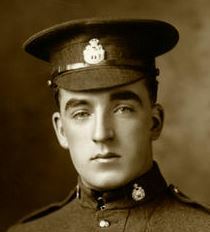 George enlisted in the army in 1916 and spent six months working with the Engineers digging a tunnel under Vimy Ridge. On April 13, 1917, when the men went over the top, George got a slight bullet wound in his side and arm. He was sent to England for attention. George returned to the trenches, where the damp cold brought on rheumatism. On March 30, 1918 he was given an honorable discharge (In accordance with HQ 16-1-21-3 of 21/10/17 having been placed in category CII as a result of sickness, specifically myalgic and rheumatic pain, and flat feet.). He came back to work on his Kleskun Hill homestead in 1920, after spending some time with his sister and her family in Yorkton, Saskatchewan. On June 9, 1926 George married Florence Druce of Totteridge, England. He met her while on leave. George died of cancer on June 30, 1960. Arthur was born in England ca. 1885. He served in the British army during the war and came over from Yorkshire in 1926 and settled in Richmond Hill. Arthur was found dead in his barn in May of 1938. Candide came to Falher in 1916. He was drafted into the army. Candide died in 1972. Donat was born in Yamaska, Quebec on January 4, 1896. He came to settle in Falher in 1916, and was drafted into the army in December of 1917. He died in McLennan on December 21, 1983. George was born in St. Alphonse, Quebec on February 5, 1888. In 1915, he filed on a homestead at NE 6-78-20-W5. George first enlisted in the Canadian Army on October 13, 1915; a second attestation paper with the same regimental number is dated December 7, 1915. According to his service file, George was discharged on December 6, 1915, as he was "not likely to become an efficient soldier." A third service file with a new regimental number is dated January 1, 1917. George was declared a deserter on January 16, 1917. Walter was born in Aldershot, England on June 25, 1887. It is unknown when he first came to Canada, but he enlisted in the Canadian Army at Valcartier on September 23, 1914. At the time, his father was living at the Bell Inn in Cullompton, England (see link for a photograph). On October 14, 1915, Walter married Ada. They came to the South Peace in 1919 and filed on SW 34-70-6-W6. Gordon was born in Lac St. Anne to Magloire and Constance Letendre, some of the early Metis settlers to this area. Gordon signed up for WWI from Lake Saskatoon on July 17, 1915, at the time he owned land on the outskirts of Flying Shot Lake. He joined the 49th Regiment and left for France in April of 1916. At the time of enlistment he is listed as 23 years old standing 5 feet 7 inches tall. 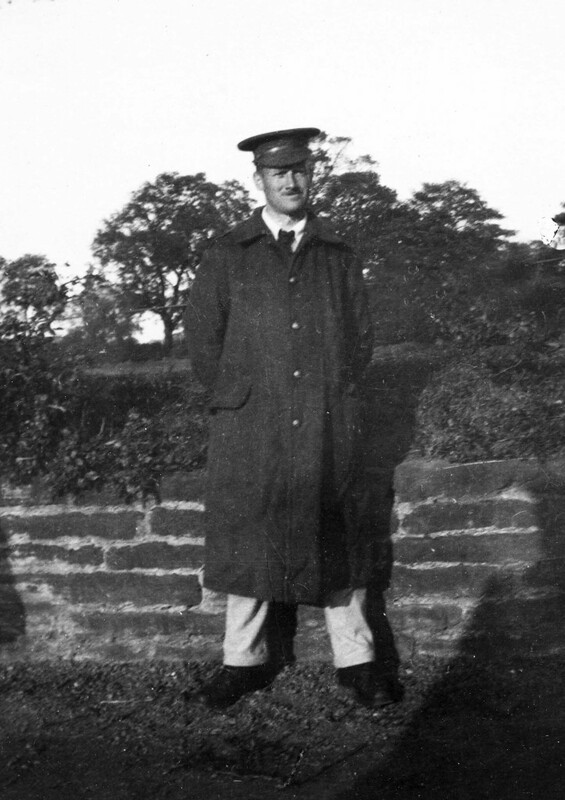 On Sept 28, 1915 he put in a request to be transferred from the 9th Reserve Battalion to the 49th. 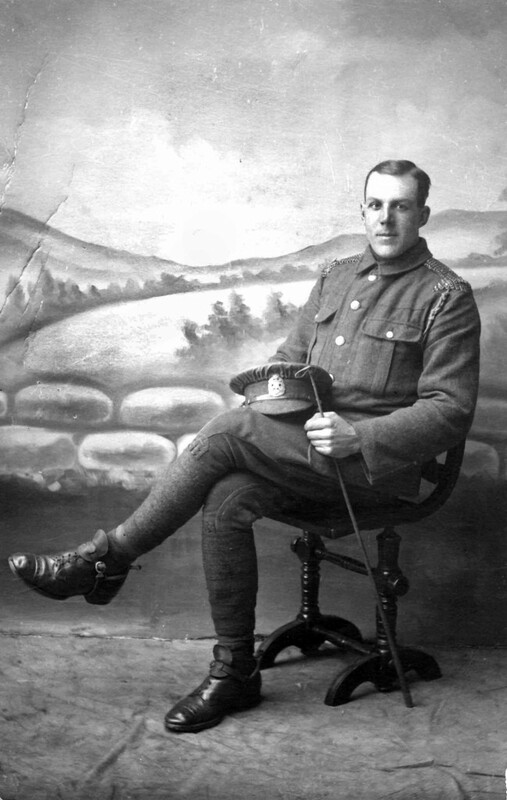 Gordon was wounded in June 1916 (shell or shrapnel wounds to his left side and leg) at the Battle of Mount Sorrel, which was a prelude to the Somme offensive. He was transported to the 3rd Canadian Casualty Clearing Station hospital where he died on June 4, 1916 from the wounds he received. Gordon is buried at Lijssenthoek Military Cemetery in Belgium. His grave marker is inscribed with "Ave Maria for this brave son of Canada." Joseph was born in Brighton, Ontario on November 25, 1871. He and his wife Maria Jane and their four children were living in Kelwood, Manitoba at the time of his enlistment in March of 1916. Joseph, already well into his forties, complained of being easily tired, shortness of breath, and various other symptoms (see page 11 of his service file). He was discharged on November 12, 1918. In 1928, the family came to the South Peace, where Joseph filed on the western half of 31-72-26-W5. Joseph died on February 4, 1956. George came to the Peace country in 1911 from Agincourt, Ontario. James was born on October 23, 1884 in Dundee, Scotland. In 1914, he filed on homesteads at NW 5-74-7-W6 and SW 6-74-7-W6. James was killed in action at Ypres on July 15, 1916 and buried in the Railway Dugouts Burial Ground in Belgium. John was born on February 5, 1895 in Preston, Lancashire, England. He filed on a homestead at 24-71-11-W6 in the Halcourt area. John was drafted in May of 1918, near the end of the war, and never made it overseas. Harry was born on August 21, 1888 in Bronté, Ontario. He joined the army in September 1915 to serve in World War I. Harry received a gunshot wound in his right knee on September 18, 1916. Wesley was born in Smith Falls, Ontario on February 17, 1894. He had a homestead near Bezanson. Wesley was wounded at the battle of Courcelette on October 31, 1916. He received a gunshot wound in right thigh, as well as shrapnel wounds. A number of surgeries were performed in attempt to fix internal damage the wounds caused. He was discharged in 1917 and returned to Grande Prairie in October of that year. Wesley reattested in January of 1918. Seven months later, he was discharged again as being physically unfit. He died in March of 1957. Francois was born in Sorel, Quebec on November 3, 1884. He arrived in Falher in 1913 and took up a homestead. He was drafted into the army toward the end of the war, and stayed in France for a year after the war ended to help rebuild. Francois died in Peace River on February 5, 1977. Ole was born in Bardu, Norway on July 17, 1892. He was the fifth of eleven children born to Petra and Bersvend. Ole immigrated to Canada in 1912 and arrived in Grande Prairie in 1914. He filed on two homesteads north of La Glace, 27-74-8-W6 at 24-74-8-W6. Ole died in July of 1966. George was born in Quebec on May 20, 1896. He was drafted in May of 1918, but though he shipped to England, George never saw action at the front lines. He died of influenza at No. 12 Canadian General Hospital, Bramshott, on November 4, 1918. Louis was born in Pigeon Lake, Manitoba on October 16, 1897. He joined up in 1914 and was one of the survivors of Vimy Ridge. Louis married Mabel Adams on September 20, 1922, and they came to the Peace country in the late 1920s. He died on January 3, 1984. Herbert was born in Gillingham, England on April 11, 1895. In 1948 he received a commemorative medallion as a reminder of his part in the liberation of Mons in World War I. Herbert was a dispatch rider in the CEMT and entered Mons a few hours after the liberation. He died in Grande Prairie in January of 1957. A park in Grande Prairie was named after him in 2014. Cecil Bice was born in Ailsa Craig, Ontario on December 4, 1894. He settled in Belloy in 1919 and worked for the ED&BC Railway. Cecil married Mary Francis McDaid, who had immigrated from Ireland. They had three children. Sadly, Mary died after the birth of the youngest daughter, Virginia. Cecil hired a housekeeper, Grace Reid, who came when Virginia was ten months old. Cecil and Grace later married and had three children. In 1931 the Bice family relocated to Rahab (later Codesa) and started farming. Cecil died in 1952. Spencer was the son of William Bigg of Borley Place, Sudbury, Suffolk, England. He owned a quarter section at 33-70-12-W6, west of Rio Grande. During World War I he served in the Royal Naval Canadian Volunteer Reserve, on board the HMCS Arleux. He died on October 10, 1918. Thomas was born in Leicester, England on June 7, 1884. During World War I, he served in England's Leicestershire Regiment (1st Battalion). He had previously worked as a house painter. On March 5, 1915, Thomas married Edith Alice Munday "within British lines" in Boulogne-sur-Mer, France. Thomas filed on the northern half of 24-73-10-W6 in 1918. He died in Toronto on August 31, 1965. George Birch was born on November 14, 1893 in Rosedale, Manitoba. He enlisted in the army during World War I, and served his country again in World War II. In 1920 he married Mary Violet Attree. The family moved to Donnelly in 1928. George died in 1970. Otto was born in Ellbok, Sweden on April 9, 1879. He was killed in action on October 9, 1918 by a gunshot wound in the back. Corporal Harold Black was discharged in London, Ontario on January 30, 1919. He did not arrive in Canada in good health, and contracted tuberculosis only a few months after his return, probably as a result of having been severely gassed during the war. Harry took up residence at the Central Alberta Sanitarium (now Baker Park) in Calgary, where he died of a sudden hemorrhage on April 10, 1923 at 31 years of age. He is buried in the family plot at Belsyde Cemetery in Fergus, Ontario. Hubert was born in Fergus, Ontario on September 17, 1886. He and his brother Harry came to the Peace country in 1913 and settled in Halcourt. 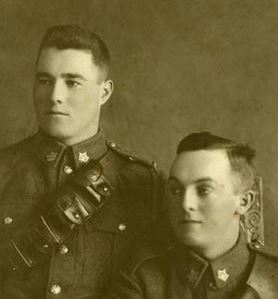 Shortly after the outbreak of the war, both brothers and neighbor Gordon Moyer walked forty miles to Grande Prairie to enlist. Hubert was turned down for being too slender. Several years later, in 1918, he was drafted into the army. Hubert received numerous shrapnel wounds on October 9, 1918 and spent some months in a hospital in England. He returned to his homestead after he was discharged. In 1929, Hubert returned to Fergus and on February 16 married Emma Mills. They came back to Halcourt, where they lived until 1945, at which time they moved to Aldergrove, BC. Hubert died in 1968. Gilbert was born in Stanton Harcourt, England on October 1, 1885. Before serving in World War I, he had served with the Oxford Yeomanry Troops for three years. As an officer, he was frequently transferred to different units for temporary duty and was mentioned in Sir Douglas Haig's dispatch April 9, 1917. Gilbert was married to Edith H. Blake. Fred was born in Hampshire, England on March 6, 1862. He joined the British navy in 1878 and served for nine years. His first military service was in Egypt in 1882. Fred first came to the Peace country in 1909 and settled in Lake Saskatoon with his wife Emily and their family. In 1915, Fred went to Edmonton to join up. He lied about his age, writing 1870 as the year of his birth. He celebrated his 55th birthday in the trenches, and was discharged in 1918 before the end of the war. Fred died on March 15, 1930 and was buried with full military honors in the Soldiers' Plot at Hope, British Columbia. Stephen was born in London, England in 1894. He married his wife Lizzie in Grande Prairie in 1928. They had come to the area from Miami, Manitoba. Three of their five children were born during the five years they lived in the Peace country. In 1933 they returned to Miami. Steve passed away on November 12, 1970. Leonard was born in Halifax, Nova Scotia on December 30, 1895. Prior to his service in World War I, he had served in the 63rd Royal Halifax Rifles. He came to the Peace Country in 1916 to look for land, but the weather was not favorable for farming that year and instead, he enlisted in the army in June of that year. He received a gunshot wound in his right arm on August 12, 1918, and a minor gunshot wound to his head on October 11, 1918. After the war, in 1921, Leonard married Gudrun Lee and they lived near Carstairs until 1948 when the family returned to the Peace Country. John was born in Russia on January 26, 1897. He was living in Brown, Manitoba when he was drafted in 1918; having been drafted so late in the war, he served only in England. 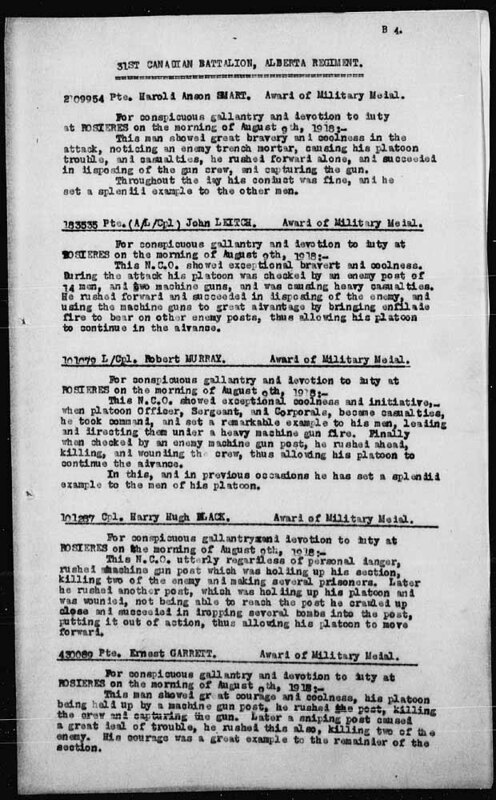 According to his service file, John's lower jaw was fractured on May 30, 1919 while fighting a civilian in Scotland (the civilian assaulted him). John came to the Crystal Creek area in 1928 and bought Henry Fortier's land. In 1942, he married Kathleen Stelfox. John died in 1972 and was buried in the Grande Prairie cemetery. Charles was born in Chester, England on October 4, 1884. At the time of his enlistment in February of 1916, he was farming in Hutton, Alberta. Charles was wounded in action twice; he received a gunshot wound to the head in May of 1917, and shrapnel wounds to his left shoulder in October of 1917. A month later he was awarded the military medal for "bravery in the field." In August of 1918, bricks fell on Charles's right shoulder and he was injured yet again. According to a doctor's report the following month, "he has been slow in response to treatment because he has not been anxious to get along." In November of 1918 Charles was granted permission to marry, though his pay had been going to his wife, Rosa Dorothy Heath, for some time before that. The couple had two sons, Gordon and Donald. According to Rosa's obituary (September 1984), she and Charles had come to Grande Prairie in 1956. Not long after that, on June 2, 1957, Charles died and was buried in the Grande Prairie cemetery. William was born in Norfolk, England between 1871 and 1873. He was married to Anna Collison (sister of Christian Collison, another South Peace soldier), who was born on November 14, 1875. William and Anna had two daughters, Gladys Maud (born in Norfolk in March of 1899) and Hilda May, born ca. 1901. William served in the British Army during World War I. In 1919, he filed on homesteads at SW 28-78-20-W5 and NE 20-78-20-W5. On his application, he listed his occupation as surveyor. Forrest was born in Mystic, Quebec on January 1, 1894. He came west and filed on a homestead at 9-70-11-W6, in the Halcourt district. Forrest was drafted in January of 1918, but though he shipped overseas to England, the war had ended before he saw active duty at the front lines of France. Lawrence was born on September 2, 1897 in Elma, Washington. At the time of his enlistment on May 19, 1918, he was living in Swift Current. His time in the army was short as he was discharged in December that same year. Lawrence died in March of 1969 and was buried in the Emerson Trail cemetery. Fred was born in Rosehill, Manitoba on October 29, 1886. He joined the Canadian forces in 1915. In May of 1916 a shell exploded near him and he received shrapnel wounds to his face and right eye. At this time it was also discovered that he had deformed toes and ingrown toenails, a painful ailment for a soldier. Fred was back in hospital for trench foot in November 1916, and it is noted on his medical records that he was very pale and suffering from fainting spells. On September 14, 1918, Fred was promoted to the rank of sergeant. Toward the end of the war, he volunteered to go to northern Russia, and it was late summer 1919 before he returned to Canada. At that time Fred came up to the LaGlace area and purchased SW 10-74-8-6. While in England, Fred had met Agnes Gibson, an English girl, during the war and the couple was married in January 1921 in Bridgeport, Connecticut at the home of Agnes's uncle. They returned to the farm in LaGlace. Fred died in LaGlace in April of 1968. Walter Bond was born in Glasgow, Scotland on June 26, 1898. He came to Canada in 1911 to live with friends in Saskatchewan. In 1915 he enlisted in the Canadian army and served as a military policeman. At one time he was the Middle Weight Champion of the army. He returned to Canada after the war and married Edith Bolingbroke in Saskatchewan. The couple moved to the south Peace and settled near Beaverlodge. Walter served as the first Dominion Land Sub-Agent at Beaverlodge in 1925. Over the years, he also worked as a machine agent, postmaster, and mayor of Beaverlodge. Walter and Edith moved to Victoria in 1959 to retire. Walter died on July 21, 1966. Steve was born in Mala, Poland on September 7, 1897. He served in the Polish army and was a prisoner of war in Germany for three years. Steve immigrated to Canada in 1928, and arrived in Spirit River in 1929 to file on a homestead. In 1930, he married Eva Sczerbiak. The couple separated in 1951 and Steve moved to Edmonton. He returned to Grande Prairie in 1973 and died in Spirit River in August of 1986. Nick was born in Tarashcha, Russia on February 9, 1893. He came over the Edson Trail to the Peace country in 1913 and filed on a homestead at SW 16-74-6-6. He enlisted in the Canadian in army in 1917. Nick died in Grande Prairie on March 13, 1964. Eduard was born in Montreal, Quebec on November 25, 1866, though he lied about his age on his Attestation Paper, stating that he had been born in 1872. Eduard took a homestead in Leduc in 1893. In 1915 he enlisted in the army. Eduard received gunshot wounds to his right arm at Ypres, most likely in the Battle of Mont Sorrel, on June 13, 1916. He was discharged on July 20, 1918, having been wounded once again. Eduard was married to Lizzie, but by the time of the war, they were separated. The couple had eight children, five boys and three girls between the ages of 13 and 27. After the war, he settled in Teepee Creek (SW 2-74-3-6) where he lived until the end of his life. Eduard died in an Edmonton hospital on June 15, 1940 and was buried in the Soldier's Plot in an Edmonton cemetery. Jean was born on June 18, 1896 in southern France, near the Spanish border, and grew up in Passy, a town 24 km from Paris. When he completed his education, he planned a trip to Canada and arrived in Quebec in April 1914. He came to McLennan, but in 1915 was called to serve in the French Army and so he returned to his homeland. 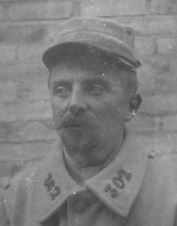 Jean fought in the Battle of Verdun. He eventually returned to the south Peace and married Eva Pelletier. Jean died on February 13, 1988. Franklin was born in Leeds, England on February 5, 1887. At the time of his enlistment in January of 1915, Franklin and his wife Lucie were living in Edmonton. He was awarded the Meritorious Service Medal. It is unknown when Franklin and Lucie came to Grande Prairie, but Franklin died on May 12, 1964 and was buried in the Grande Prairie cemetery. William was born in Wyndette, Michigan on January 29, 1889. At the time of the war, he was living in Assiniboia, Saskatchewan and he enlisted in the army in 1916. He eventually settled in the Peace country on 10-80-8-6. Elmer was born in Frinnesos (Frillesås? ), Sweden on June 23, 1888. He and his brothers, Ivar and Alfred, came to Valhalla from the United States in 1916 and filed on a homestead at 25-74-10-W6. Elmer was drafted in 1918, but was arrested as a "Group 2 Defaulter" on October 25, 1918, the day he signed up. He left the area in 1922 or 1923 to work at the Ford Assembly Plant in Detroit and never returned. Joseph was born in Saint Georges, Beauce County, Quebec on January 29, 1888. When the war began, he and his wife, Rose Alma, were living in Grande Prairie. Joseph enlisted in the Canadian army on September 27, 1915 and was discharged on December 9, 1915, having been deemed "medically unfit for further service," though there is no record of his having been wounded in action. Paul was born in France and immigrated to Canada with his family. He came out west in 1913 and filed on a homestead at NE 24-78-22-5. When the war began, Paul was called to join the French army. He requested to be transferred to the Canadian army. The request was granted, but Paul was killed in action not long after. William was born in Burnley, England on February 12, 1895. He immigrated to Canada and farmed in the south Peace until he enlisted in the Canadian army in 1915. On September 16, 1916, during the Battle of the Somme, William received a gunshot wound to his right thigh. He spent three months in hospital. He was also wounded in the left hand on October 3, 1918. William was granted permission to marry on August 8, 1917 and returned to Grande Prairie in 1919 with his English bride, Mary. Sylvester was born in Middleburg, Pennsylvania on August 17, 1872. He came to farm in Grande Prairie with his parents. At the time of his enlistment on March 13, 1916, Sylvester was a widower. He was discharged on June 5, 1916 for being medically unfit. Benjamin was born to Thomas and Elizabeth Boyd on February 21, 1891 in Arundel, Quebec. Ben and his brother Joe worked for the Bell Telephone Company in 1909, constructing the main line from Winnipeg to Edmonton. They arrived in Beaverlodge in 1910 and wrote to their mother, Elizabeth Boyd Loudfoot (who had been twice widowed) to come out with her younger sons. Ben filed on SE 10-71-8-W6 on August 16, 1910. He proved up and enlisted in 1914. Ben received a shrapnel wound in his thumb on August 18, 1916 and less than two months later was killed in action at Courcelette on October 9, 1916. He is remembered at the Vimy Memorial in Pas-de-Calais, France. Joseph was born to Thomas and Elizabeth Boyd on January 15, 1884 in Arundel, Quebec. Joe and his brother Ben worked for the Bell Telephone Company in 1909, constructing the main line from Winnipeg to Edmonton. They arrived in Beaverlodge in 1910 and wrote to their mother, Elizabeth Boyd Loudfoot (who had been twice widowed) to come out with her younger sons. Joe filed on SW 10-71-8-W6 on May 26, 1910. He joined the Canadian forces in 1915 and was wounded overseas - first in the left shoulder on August 16, 1916 and again in the left hand on October 30, 1917 (both were gunshot wounds). He was promoted to the rank of sergeant on September 10, 1918, and in December of 1918, Joe's mother received word that he had been awarded the Military Medal for conspicuous bravery on the battlefield. Joe married Edith Cassidy, a Lake Saskatoon schoolteacher, in February of 1920. The couple later moved to Prince George, BC, where Joe went into the lumber business. He died in 1965. Frederick was born in Rougham, Suffolk, England on February 10, 1892. He enlisted in the Canadian Army on January 6, 1916 and served in France, where he was slightly wounded in the leg. He sprained his ankle in September 1917 while on duty at Shoreham Camp by tripping over a stone in the dark. Fred returned to Rouleau, Saskatchewan after the war. In the late 1920s, Fred and his brother Herb came to the Peace country and purchased E 25-72-8-W6. They farmed together for many years. Fred died on August 30, 1965 in the Grande Prairie Hospital. Herb Bradley was born in Bury St. Edmonds, Suffolk, England in 1898. In order to join the British army, he lied about his age. Herb first served in World War I until 1918, then joined the British overseas force in India, where he spent four years. In the late 1920s, Herb and his brother Fred came to the Peace country and purchased E 25-72-8-W6. They farmed together for many years. Herb was known for his good housekeeping, even baking his own bread and canning fruit. Herb died in Wembley in 1977. Francois was born in France. His stepfather provided Francois with the money he needed to purchase a farm in the Peace country, where he lived near his friends, the Bremonts. When the war started, Francois was called to serve in the French army. He spent only a few years in the area. Ernest was born in Norfolk, England on November 20, 1890 and was a surveyor by trade. He enlisted in the Canadian Army in Edmonton in July of 1915. Ernest received a gunshot wound to his left elbow in October 1916 at the Somme. He was discharged on November 30, 1917 because of flat feet. Arthur was born in Somme-Vesle, France on August 8, 1887. In 1912, he left for Canada to begin a new life and in December of that year arrived at his homestead near Falher. When the war began, Arthur returned to France to join the French army. He fought in the Battle of Verdun. After the war, Arthur spent a year in his native village of Somme-Vesle to rest and recover. During this time he met Lucienne Despres and they were married on March 9, 1920. They left France three weeks later and moved back to Falher. The couple retired to Victoria, where Arthur died in 1967. Charles was born in Moore, New Zealand on May 5, 1876. He went to England and there met and married Rose Mitchum in 1895. They came to Canada and lived for a time in Ontario, before moving on to Vancouver. When the war broke out, Charles and his two eldest sons joined up and went overseas. Rose did Red Cross work as a nurse’s aid. The family moved to the Peace country after the war and Charles homesteaded on N ½ 12-73-3-W6 near the Smoky River. When the youngest son Wesley and his family moved to Whonnock, BC in 1945, Charles sold his land and moved to be near them. He died on August 1, 1952. Ernest was born to Charles and Rose Brewer in Ottawa, Ontario on June 30, 1896. The family moved to Vancouver when he was still a child. Ernest, along with his father and brother, went overseas with the Canadian army during World War I. He received a minor gunshot wound in the back in June of 1916. The family moved to the Peace country after the war, though Ernest did not stay long. In 1922, he and his wife Betty and their young son moved to New Jersey. Rose Mitchum married Charles Brewer in England in 1895. They came to Canada and lived for a time in Ontario, before moving on to Vancouver. When the war broke out, her husband and two eldest sons joined up and went overseas. Rose did Red Cross work as a nurse’s aid. The family moved to the Peace country after the war and Charles homesteaded on N ½ 12-73-3-W6 near the Smoky River. Walter was born to Charles & Rose Brewer in Ottawa, Ontario on December 18, 1897. The family moved to Vancouver when he was still a child. Walter, along with his father and brother, went overseas with the Canadian army during World War I. The family moved to the Peace country after the war. Walter did not feel farming was for him, however, and returned to Vancouver. On the way he spent some time in Edmonton, where he met and married his wife Megan. Allie was born on October 23, 1900 in Fort Vermilion. He was underage when he joined the Canadian army and listed his year of birth as 1899. Allie served only in England. By 1923 he was part of the staff at the Land Office in Grande Prairie. Allie married Viola Gordon on October 29, 1925; the couple had four children. Later, in 1933, Allie worked for the provincial government in Peace River. He once again enlisted in the Canadian army during World War II and served from 1941 until 1945. In 1958, Allie began working for the Lands & Mines Department in Edmonton; he kept this position until his retirement in 1965. Allie spent the last nine months of his life in the Mewburn Veteran's Home and died on August 19, 1983 in Edmonton. Philip was born in London, England on July 10, 1892. He came to Grande Prairie in 1912 and homesteaded at Five Mile Creek. Philip was among the first to enlist from Grande Prairie - he joined up in November of 1914. He was killed in action on May 20, 1917, and is buried in Etaples Military Cemetery in Pas-de-Calais, France. Philip's grave marker is inscribed with "Loved by all." Bert was born in Haworth, Yorkshire, England on June 25, 1885. According to British Columbia's divorce records, Bert was married in Seaford, England on February 9, 1917 to a woman named Edith (the marriage was dissolved in 1925). In December 1917, Bert was sent back to Canada because of signs of pulmonary tuberculosis (his mother had died of the same when he was a teenager) and was discharged a few months later. Bert filed on a homestead in the Peace country in 1926, and received the title in 1931. Unfortunately, although he was a good farmer (and accomplished pianist), Bert was in poor health. He died back in England in 1955. James left his home in Thurso, Scotland to come to Grande Prairie in 1910. His homestead was located at 17-72-4 in the Glen Leslie district. From 1914 until about late 1915 James was Kleskun Hill's postmaster. He had served in the British army in the South African War and, as a reservist, went to fight with the British army once again during the First World War. After the war, James moved to Arizona because of his health. Fred was born in Picton, Ontario on March 22, 1876. At the time of his enlistment in the Canadian army in September of 1915, Fred was a widower with three children and was working as a blacksmith, likely living in the Victoria or Vancouver area. At one point he forfeited fourteen days' pay for "careless driving on line of march." Fred filed on a homestead at SE 15-78-24-W5 on February 14, 1920. He later purchased SW 14-78-24-W5 as well. However, Fred did not stay in the South Peace region for long as his service file lists Ontario as his last known address in 1927. Fred died on April 1, 1939. William was born on March 27, 1873 in Hawkesville, Ontario. On September 30, 1903 he married Daisy "Birdie" McKay in her father's home in Spruce Grove. When the war began, William and Birdie were homesteading in Spruce Grove. He owned the first milking machine west of Edmonton but left his dairy to spend four and a half years with the forestry corps in France. After the war he worked as a homestead and timber inspector, a job that took him all over the western provinces, including the Peace River country. William died on March 6, 1954. David was born in 1899. According to his grave marker, he served in the army (presumably during World War I). His homesteads were located at 14-75-13-W6, 31-74-12-W6, and 3-75-13-W6. David died in 1975 and was buried in the Grande Prairie cemetery. Cyril was born on April 29, 1889 in Tavistock, Devon, England. He came to Spirit River with his parents and siblings in 1912 and filed on a homestead about two miles north of the old townsite. In 1915 Cyril enlisted to serve in the Canadian army. He suffered from shell shock in early 1916; according to his discharge papers he "was in France five months when blown up by shell. No disability, no wounds." Cyril was promoted to Lance Corporal on October 29, 1917. He was shot through the left shoulder on August 9, 1918 at Rosieres. Some of the bone was taken away, and some small pieces of bone continued to break loose later. Cyril could not hold up any weight for any length of time even after shoulder healed. Because of this injury, he was invalided to Canada in March 1919. Cyril died on June 12, 1965. Jasper was born in Lakefield, Ontario on July 16, 1897. He was living in Alix, Alberta when he was drafted in June of 1918. Jasper served only in England. In 1929, he came to the South Peace and filed on NE 10-71-26-W5 and NW 31-78-24-W5. Leonard was born in Winshill, near Burton on Trent, England on April 6, 1892. He came to Manitoba as a young man. Leonard came to the Peace River country in 1921 and filed on homesteads at 72-26-W5, NW 17-26-W5, SW 20-26-W5, and NE 11-41-W6. Leonard died in fall of 1976 and was buried in the DeBolt cemetery. Alexander was born to John and Jane Brotherston on June 25, 1889 in Little Groat, Scotland. He was injured during the war and spent some time in an English hospital in late 1916. Alexander was killed in action on June 8, 1917 and is remembered at the Vimy Memorial in Pas-de-Calais, France. Adam was born in Dumfries, Scotland on February 7, 1871. When he was fourteen, he and his parents immigrated to Iowa. Adam studied in Chicago to be a veterinarian and later moved to Airdrie, Alberta. After the war, he settled in the Teepee Creek area (N 1/2-19-74-3-6), where land had been opened for settlement by veterans. His services as a veterinarian were in great demand. After retiring, Adam lived a few years in Sexsmith and died in a nursing home in Edmonton. Alfred was born in England 1885 and died in 1965. Frank was born in Kalamazoo, Michigan on November 3, 1895. He joined up in Edmonton, along with his brother Glenn, in July of 1915 and listed his trade as "homesteader." Glenn was born in Kalamazoo, Michigan on January 19, 1888. He joined up in Edmonton, along with his brother Frank, in July of 1915 and listed his trade as "homesteader." Prior to the first world war, Glenn had served for three years in the American infantry and four years in the navy. His medical records note that part of his left middle finger was missing, having been chopped off with a meat cleaver in 1911, at which time he was in the navy. Glenn suffered from shell shock in September 1916 and was promoted to Lance Corporal on October 23, 1918. Hector, as he was known, was born in Barrie, Ontario on May 25, 1892. He came to Grande Prairie with his parents and was educated here. He received the Military Medal on November 2, 1917 for bravery in the field. Hector died on April 28, 1949. Joseph was born in Denver, Colorado on April 17, 1895. He was farming in Spirit River (likely at SW26-77-5-6) when the war started, and enlisted in Edmonton on August 7, 1916. A few months later, on December 4, 1916, Joseph deserted in Calgary. Sydney was born in Leytonstone, London, England on October 15, 1897. He was a farmer in the Grande Prairie area when the first world war began, and he joined up in Edmonton in September of 1915. William was born on July 12, 1892 in Hamiota, Manitoba. He joined the army in 1915. At that time he had been surveying on the west coast of BC. William received the Military Medal for bravery (Wagon Trails says at Ypres in 1915, though his service files indicate that the medal was received in 1917 in France). During officer's training in Bexhill, England, he played soccer for the Canadian Army and broke his leg there on December 12, 1917. William had an opportunity to stay in England to play professional soccer, but returned to Canada in 1919. In 1918, William met Melanie Grandsard, a Belgian refugee, who was working as an interpreter for the Rolls Royce Company in Derby. They were married on June 20, 1918 in London. William arrived in Sexsmith in May of 1919 and settled on SW Section 9 in the Mount Star area, and Melanie followed him in August. The couple had one son, Cecil Robert, and one daughter, Delphine. William once again joined the army in 1940 and was discharged in 1947 with the rank of major. He died on February 7, 1977. William Bruce was born on March 11, 1877 in Dumbarton, Scotland. He came to Canada in the early 1900s and homesteaded three miles southwest of what would later be the site of Wembley. Billy joined the army during World War I and was gassed during his time overseas. In 1918, he returned to the Peace Country and once again took up farming. He died on June 9, 1945. Thomas was born in Binbrook, England on May 14, 1877. He worked on farm estates until war broke out. Thomas served in both France and India. On December 6, 1919, he married Ellen Eyre. The couple came to the Sexsmith area in 1925 and received their Soldier Settlement land at SE6-71-7-W6 and NW31-70-7-W6 in 1926. The couple had two daughters, Doreen Mary and Elizabeth (Betty) Ellen. In 1954 Tom and Ellen moved into Grande Prairie. Tom died on July 1, 1963. Arthur Buck was born December 11, 1889. He filed on N.W. 33-72-8 on Dec 12, 1911. He enlisted in the Canadian army on 22 July, 1915 and served in the Canadian Overseas Expeditionary Force. Arthur received a gunshot wound to his left forearm at the Somme on October 11, 1916. He died at the No. 44 Casualty Clearing Station on November 1, 1917 from shrapnel wounds in the chest and shoulders and is buried in Nine Elms British Cemetery, Poperinghe, Belgium. Arthur's grave marker is inscribed with "It is not death but sleep." Charles William Buck was born in 1886. He and his younger brother emigrated to Canada. On August 12,1910 Charles filed on N.E. 32-72-8 W6 and also on a 1/2 section of South African Script -S 1/2 33-72-8 W6. 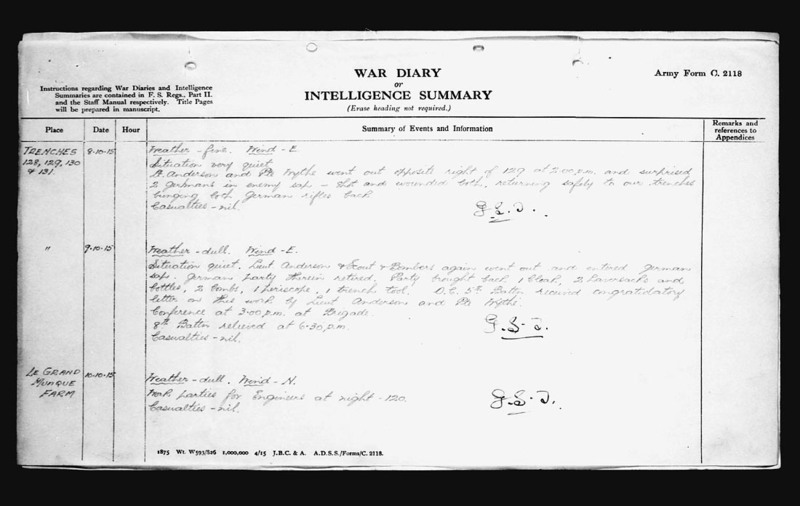 On his return from WWl, on July 3, 1918, he filed on N.E. 6-74-8 W6. His farm was called Poplar Grove Farm in the Lake Saskatoon district. He enlisted with the British military in WWl as a private with the 2nd King Edwards Horse (1352), later becoming a gunner in the Tank Corps (300485). He returned to Canada a sick man after the war, married to ‘Cis’, an English nurse, who followed him back to Lake Saskatoon. It was understood that he had been badly gassed during the war. In a letter from the farm to his sister Edith Mary, 12 February, 1920 he said he was staying with a Mrs. Moore; he had been ill for over a year and intended to apply to the military doctor in Edmonton for help. He died March 4, 1920 and was buried in the St. Andrew's Anglican Church Cemetery. Charles’ widow, Phoebe Elizabeth (Lawrence) Buck, married Norman Anderson in 1921. George was born in Hamilton, Ontario on April 6, 1893. He came west and settled in the Rio Grande area in 1913. 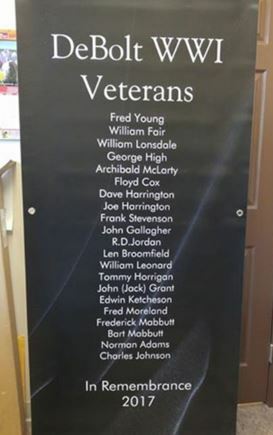 George served in England and France with the 10th Canadian Infantry Battalion. According to his military medical records, two fingers on his left hand had been "crushed by drop hammer" and partially amputated in 1912. After the war, he returned to his farm. In 1926, he met Minnie Mayer and they were married on April 29, 1928. George and Minnie had ten children. In addition to farming, George operated a small truck between Rio Grande, Halcourt, and Beaverlodge. He died in Edmonton on March 15, 1962. Reginald was born in Northampton, England on September 21, 1897. He came to Canada with his parents in 1903, and the family settled in Lloydminster. Reg enlisted in the 188th Battalion in 1915 and was discharged on April 30, 1917 because of tuberculosis. He met his wife Jean in Fort Saskatchewan after the war. In 1929, Reg bought a hardware business in Wembley and eventually bought the South Wapiti Lumber Mill as well. Reg served for years as Councillor and Mayor of Wembley. He died on June 11, 1955 at 57, and was buried in Lake Saskatoon Cemetery. Harry was born in St. Albert, Alberta on August 15, 1896. He was still living in St. Albert at the time of his enlistment in September of 1916, though his sister was living in Smoky River. Harry was gassed in November of 1917. At some point after the war, he came to the South Peace and filed on homesteads at 5-74-12-W6 and 35-70-7-W6. Harry died in 1969 and was buried in the Grande Prairie cemetery. Margaret was born in 1897 in Wexford, Ireland. She was a teenager at the time of the 1916 Easter Rebellion in Dublin. Margaret joined the WAAC and was stationed in London, where she met Richard Burnett. The couple was married on June 13, 1921, and came west to Richard's homestead in Elmworth. Richard was born in Cardiff, Wales on December 26, 1887. His family immigrated to Niagara Falls when he was an early teen, and he continued on to the Peace Country in 1916 and filed on his homestead on October 4. Just three months later, he enlisted in the Canadian army and went overseas. On one of his leaves he met Margaret Scallon, an Irish woman stationed in London with the WAAC. The couple was married on June 13, 1921 and they headed west to Richard's homestead in Elmworth.